The day of French President Emmanuel Macron's three-month national debate got off to a rocky start after he said that he would like to put more "responsibility" on people struggling with poverty because "there are those who do well" and some of them just "muck about". 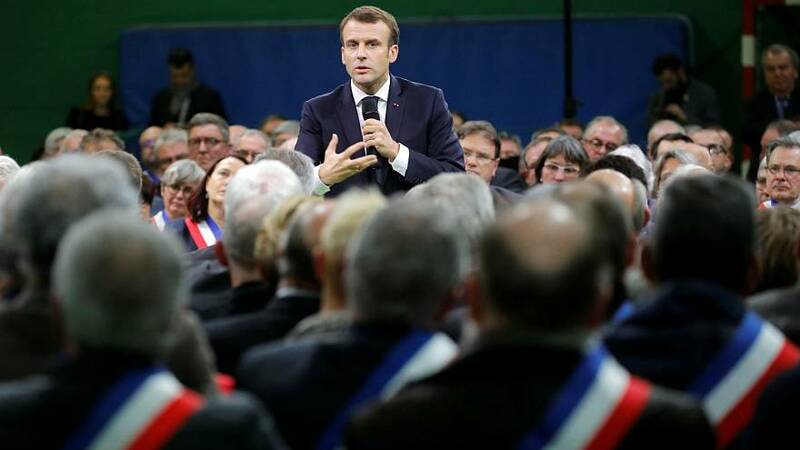 Macron made the comments at a municipal council in the northern town of Gasny on Tuesday before his Great National Debate initiative was launched. "Those who are struggling, we're going to give them more responsibility because among them are some who are doing well and some who are mucking about." The French president is no stranger to controversy and frequently faces accusations of patronising his electorate. Last year he told an unemployed man that he only had to "cross the road" to find work. He was immediately criticised by political opponents for his latest remarks. "2019 is starting as it will finish. Debates are being opened but still the same contempt for the French people!" tweeted Valerie Boyer, a right-wing MP. "[Macron] launched the grand debate by targeting those in (economic) difficulty who are 'mucking about'. How can we appease and bring the country together if we continue to stigmatise and make the French oppose each other? We need to change politics but we also need to change attitudes within power," tweeted right-wing MP Daniel Fasquelle. What is the 'Great National Debate'? The Great National Debate was organised to placate gilets jaunes (yellow vest) protesters. A series of town hall-style gatherings were to be held across the country where citizens could speak to their local mayors about their concerns. At the first one, held in the northern town of Bourgtheroulde along with 600 mayors from the Normandy region, Macron said he hoped the discussions would be free of "taboos". "Beyond those written, all questions are open-ended," said the president. "If there are intelligent questions, topics that I have not seen that emerge, they will be addressed. There must be no taboos when we speak to each other." Macron talked about "social fractures" including territorial, economic, and democratic that had led to the gilets jaunes protests. In this first debate, questions concerning the closure of public hospitals in rural areas, social justice, and the wealth tax that Macron's administration scrapped were brought up by mayors. How the debate supposed to work? The public forums will run for two months until March 15. Macron said he would use the proposals that come out of the sessions in order to build “a new contract with the nation”. The meetings will be held in local auditoriums or in other public facilities. Ministers in Macron's government Sebastien Lecornu and Emmanuelle Wargon were tasked with organising the sessions. Five independent auditors were chosen to make sure that the government was not overtly interfering in the debates. From January 21, people will be able to make proposals online at www.granddebate.fr and starting on March 1, the government will be holding “regional citizen conferences”, intended to summarise the main findings from the sessions and establish concrete proposals for Macron to consider. What are the permitted topics of discussion? In a letter to the French people, Macron said that no questions would be off-limits but added he would remain faithful to his economic reform agenda. Macron set out four main areas as a framework for discussion: tax and government spending, public services, the environment, and representation of the French people in government. However, on the topic of immigration, Macron said the right to request asylum "could not be questioned". A poll released on Tuesday by communications strategy company Elabe found that only 13% of French people are "certain" they will participate in the debate series. As many as 40% said they had the intention of participating.